This winter, Evening Tutoring hosted a supply drive for two organizations that are neighbors of Family Matters: Care for Real in Edgewater and Refugee One in Uptown. The collected items were specifically requested by the organizations and included household items, personal care items, clothing, and food. To promote the drive, youth in Evening Tutoring created posters to hang throughout the building, letting everyone who wanted to participate know what to bring and where to put the items. Youth and tutor/mentors were also asked to spread the word to people they know outside of Family Matters. A collection box was placed on the first floor. 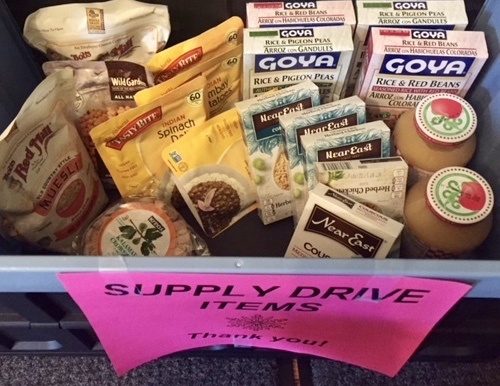 Over three weeks, multiples of the following items were collected and donated: toothpaste, soap, razors, shaving cream, shampoo, body wash, deodorant, clothing (for all seasons), boots, shoes, sheets, blankets, calendars, canned fruits and vegetables, peanut butter, and pasta. At the end of each week, the donations were delivered to Care for Real and Refugee One for disbursement to the families they work with. The idea for hosting a “drive” originated during Evening Tutoring’s Community Conversation last September. Tutor/mentoring pairs gathered together to discuss how they’d like to make a positive impact on their local and global community. The consensus was to host a supply drive, collecting items that people need and aren’t always able to access. Thanks to all who contributed to the drive for supporting these two organizations and giving back to this community!